…The nicest things can happen. This is just one table of Networkers – usually there are 15 or more! 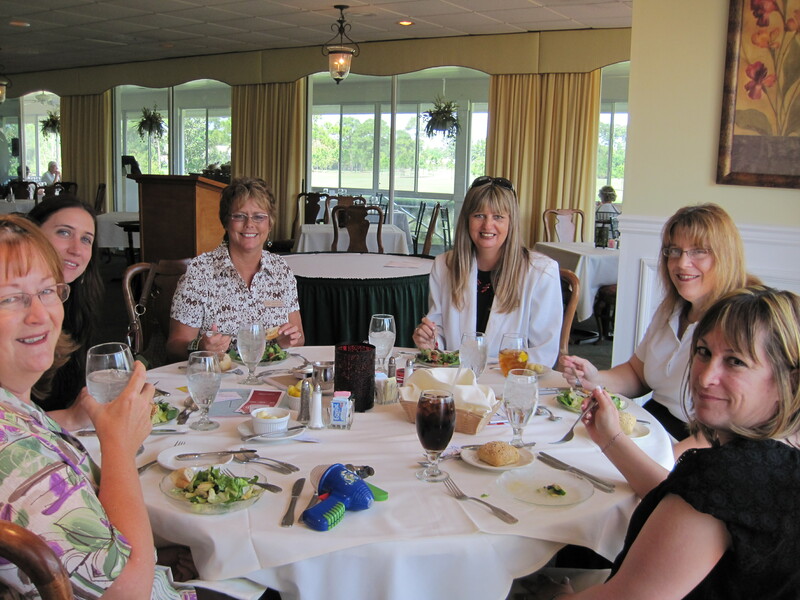 One such thing happened to me recently at the St. Lucie Networker for Business Women luncheon. To begin with this is a wonderful group of women who meet for lunch once a month to network and promote their businesses. Some of the attendees bring door prize offerings to be given out in a business card drawing. Plenty of goodies here – wine, candy, note paper, and lots of things pertaining to an individual business. (One gal represents a moving company and she frequently contributes those handy-dandy sliders that make it easy to move an armoir from one side of the room to the other.) I donated a copy of “Cracks in the Sidewalk” and a financial planner from Vero Beach won the book. That was two months ago. The way these luncheons are organized is that we start off with the door prize drawing, then each attendee gets 30-60 seconds to introduce themself and promo their business. (You’d be surprized at how much can be said in that seemingly small amount of time) After everyone has taken a turn at that, we sit back to have desert, coffee and testimonials. This is a time when anyone in the group can get up and talk about their experience of doing business with another of the group’s members. This is always the most fun and often the most surprizing part of the presentation. There is no time limit on this presentation and only one rule…you are up there to endorse someone else’s business, not your own! Well…remember that book I gave away at the luncheon two months ago? Yep, the gal who won it – DeeDee Williams – stood up and spoke about the book. DeeDee didn’t know who I was and asked that I raise my hand to identify myself…so there was no personal relationship to color her opinion. “This is without a doubt the best book I’ve ever read,” DeeDee said, “I couldn’t put it down! And once I’d finished reading it my husband started.” She said so many more wonderful things, but at the moment I was too starstruck to take them all in. I had no idea DeeDee was planing to talk about my book, which made her endorsement doubly delightful. Have I ever heard people say things like this before? Yes, but so often it’s from a friend, or a fan, or someone at a speaking engagement – people who are predisposed to liking the book because I wrote it. DeeDee said these things simply because reading the book elicited that feeling from her. To think my writing could have so profound an effect on someone without any foreshadowing of who I am or what I’ve done before, absolutely made my day. It is the purest compliment an author can recieve-one based only upon the merit of his or her work. And now onto what is perhaps the most important part of this story…never miss the opportunity to say something nice about someone if you have the chance to do so. At the very least you’ll make the other person feel good about themself (and good about you too) but you might also make a new friend. Thanks DeeDee Williams and a special thank you to Lourdes Welhaven who organizes and runs the Networker group. I’ve been to numerous ‘networking’ events, but none quite as successful and well done as these. If you are a woman in business please check out www.networkerforbusinesswomen.com and be at the next luncheon. Trust me you’ll go away glad you came! Oh yeah, and there is no membership fee, no long term committment, nothing. You simply enter your lunch reservation, pay twenty-bucks for lunch and show up. I really enjoyed this post and could relate to it. I remember prior to my joining the Briar II News staff, I went up to a gentleman in the pool, that I recognize from his pic in the paper (although, I tease him now and say it was his Bar Mitzvah pic) and told him how much I enjoyed reading his articles. We soon became fast friends. My husband and I enjoyed going out with him and his lovely wife Gail and his beautiful daughter Cindy. They owned a home in Port Richie, and when we would go down to New Tampa every winter, we always made sure we hooked up with them. Ren encouraged me to join the B2N staff, and so I did. Now, I have people coming up to me and saying, “I really enjoy your articles so much”; “I can relate to your articles”; “They make me laugh”, or if appropriate; “They bring tears to my eyes.” Whenever, I hear comments like this, it brings such JOY (my favorite word and also my middle name), to my heart.